Every year the whole nation is gripped by the annual spectacle of passion and excitement that is the Grand National. Get involved, by downloading your Grand National sweepstake kit for work, home or down your local. The 40 Grand National Runners will be confirmed on Thursday. 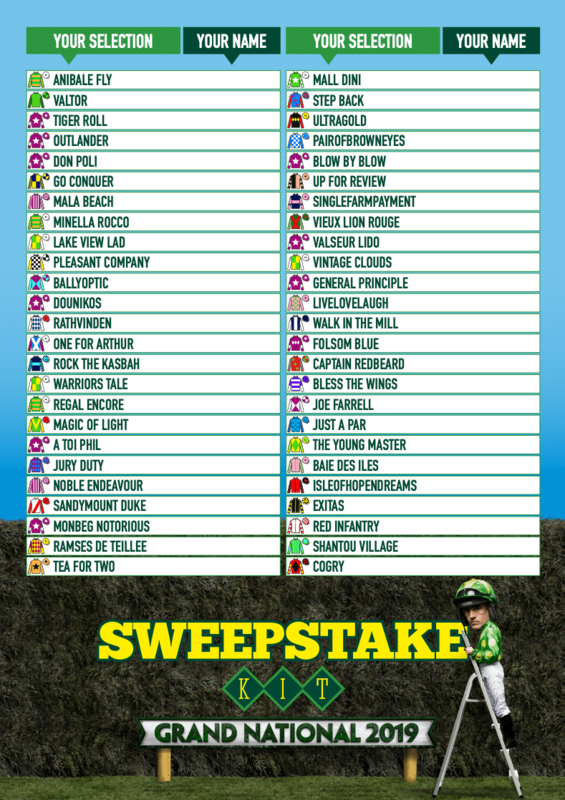 Find the Paddy Power 2019 Grand National Sweepstake Kit below. We will update this to the 2020 Kit closer to the next Grand National. Whether you’re a regular at Grand National betting or a complete novice, you can have some fun by organising a Grand National sweepstake. Round up a group of 40 friends, family or colleagues. The wider the pool, the better the competition. If you have less than 40 people, fear not. You can be assigned more than one horse to better your odds, although you’ll have to cough up a little more. Print two copies and cut out the runners into individual pieces of paper. Fold them and put them into a hat (or another suitable container). Each person pulls one horse’s name out of the hat. Write the person’s name down beside the horse that they selected. Then decide how much it costs to enter and randomly draw each horse, inserting people’s names in the table on the second copy, to keep a record of who has which horse. Perhaps charge £2 to pick a horse, making an £80 pot. Make sure you sell all of the horses. If you have some left after everyone has brought a horse, check if anyone wants a second or third horse (gentle persuasion may be required) – white lies such as implying the favourite is still available are acceptable! You’re free to split the winnings how you wish. The winner could take all, or perhaps 1st place wins £40, 2nd place £25, 3rd place £10 and 4th place £5. Just ensure you tell people what the prizes are before selling them a horse’s name. Another idea is to donate the money from the sweepstake to a charity of your choice.